Greetings again from the darkness. 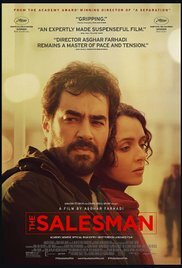 Iranian writer/director Asghar Farhadi won the Best Foreign Language Film Oscar for his 2011 A Separation, and with his latest (also Oscar nominated), he proves yet again that his unique approach to family/domestic dramas might best be described as simmering suspense artistry. He certainly knows how to tell a story and structure a film for maximum impact. Shahab Hosseini (A Separation) and Taraneh Alidoosti (About Elly) star as Emad and Rana, a normal and seemingly happily married couple. One morning, some heavy equipment jeopardizes the stability of their apartment building and they escape to the streets. Husband and wife are both performing in a community theatre production of Arthur Miller’s “Death of a Salesman” and at that evening’s rehearsal, one of their castmates, Babak (Babak Karimi) offers the couple the use of a rooftop apartment … he has recently evicted the tenant. Of course, this bit of luck comes with some baggage … specifically, the baggage and belongings of the previous tenant who (unseen to viewers) keeps telling Babak she will return for her stuff. Meanwhile, the neighbors inform Emad and Rana that the previous tenant and her “many acquaintances” (paying clients, if you get my drift) will not be missed. This history comes into play when one evening a home invasion leaves Rana dazed, injured and being treated at a local hospital. This sets off the cultural commentary about the roles and power of Iranian men vs women, as well as a psychological study of wounded pride, a need for revenge, and a scarred psyche who wishes to be neither alone nor coddled. The strained marital relationship has some interesting parallels with the scenes depicted in the Miller play, and there are also a few key moments in the build-up … moments of subtlety for the discerning viewer. Foreshadowing occurs in a seemingly humorous moment when one of Emad’s students asks during class, “How does a man become a cow?”, and Emad answers “Gradually.” A throwaway line is never really that in a Farhadi script. Most of the film centers on how Emad and Rana react to the traumatic event, and for the first two-thirds, it’s Emad’s movements that we follow. However, during the extraordinary final act, Rana becomes the focus and there is a tremendous performance from Farid Sajjadi Hosseini as an older gent in a key role. So much raw human nature is on display here – pride, revenge, forgiveness, trust, weakness, etc. It’s the type of film that has much going on even during the parts that might seem slow on the surface. Farhadi is an exceptional filmmaker, and evidently, he will just continue to prove it so. This entry was posted on Saturday, February 25th, 2017 at 1:54 pm and is filed under Drama, World Cinema/Foreign. You can follow any responses to this entry through the RSS 2.0 feed. You can leave a response, or trackback from your own site.